Swedish startup Fidesmo has developed a service that lets NFC phone owners replace multiple, physical transport passes with a single contactless card. New funds can be added to each service operator’s “card” on the go using a Fidesmo mobile app — eliminating the need to visit a physical agent to top up their balance and solving “the pain point of communicating with a contactless card after issuance”. 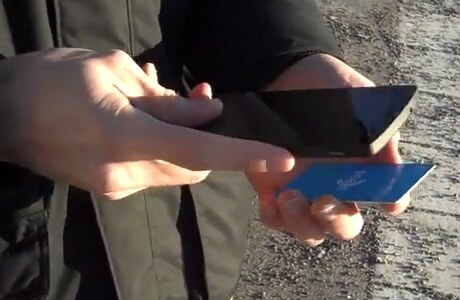 Using Fidesmo, cards from participating service operators are downloaded over the air to the user’s phone and then transferred on to the Fidesmo contactless card by touching it to the phone. The balance on each operator card can then be updated when new funds are purchased via the app, again by simply touching the Fidesmo contactless card to the phone. When travelling, the Fidesmo app allows the user to select the correct card for the operator of the transportation service they will be using and then touch their contactless card to the operator’s reader in the usual way. “The data is never really stored in the phone, but just passes through the phone to the card, so the communication is actually from the card all the way to the back end,” Fidesmo CEO Mattias Eld — a former TSM product manager at Ericsson — explains to NFC World+. “The card for the correct operator is selected once and then stays selected until a new card is selected. So, if you are in the same city, you don’t need to reselect using your mobile phone all the time, you just do it once. “When you actually use the card on board public transport, or whatever you use it for, the phone is not involved at all. The phone is only involved when you download the credentials to the card and you download those using NFC. Eld says he is not convinced people will want to “point their mobile phones at everything”, adding the card format is the one that most people feel comfortable using. “People are used to using a card and, for some situations, I think the card is the most suited form factor that we have had for quite some time now and we have gotten used to it, so it makes more sense to use it. In many cases, it just makes sense to have your credentials stored somewhere else other than on your phone. Fidesmo envisages a wide, and global, range of uses for their card, with cafe loyalty cards seen as a good fit alongside ticketing. Open APIs for developers are now open to allow them to build new services.